There are the places you want to visit, and then there are the places you absolutely must visit. For us, Athens, Greece was among the latter! We knew there'd be so many things to do in Athens. It’s not only the capital of Greece, with an intriguing culture, and a place of ancient historic ruins, but it’s also a place that thousands of years ago became the foundation of what Western society is today. Arguably, we have the culture, laws, science, math, and innovation that we have today in part because of Ancient Athens. If you’ve gotten to know us at all (About Us and About STA) and you’ve come to the conclusion that we’re the type of people to ‘geek’ out on this type of history, then you’re right! We were excited to see Greece from the air as our plane approached! Once one the ground, the views of the city were just as spectacular! We came to Athens to see some of the most famous ruins, to walk the streets ancient philosophers like Socrates and Plato walked upon, and to explore the culture of modern day Athens. We’re happy to say, that after a week and a half in Athens, we ventured through many of the neighborhoods, saw the most famous sights and ruins in the city, and discovered several hidden gems! We found that beyond ancient history, Athens has a hip, modern edge to it and some amazing food. So, there’s something for everyone, and if you’re visiting Greece, we recommend spending a few days in Athens before you head off for an island with the village life Greece is so famous for. From ancient ruins to Greek academies, and from modern churches to parliament buildings, there's something for every architectural taste! Clockwise (from the top left): Academy of Athens, Church of Saint Panteleimon, Old Parliament House, Socrates Prison on Pnyx Hill. Our exploration of a city begins well before we ever arrive in the city. As soon as we finalized our house sitting assignment in Athens, which was about two months in advance, we began our planning. Naturally, planning included travel arrangements (but thankfully not a hotel since we had a house sit), but it also included learning about Athens, Greece and what it had to offer. We’ve found after so many months of traveling and nearly 20 countries visited, that we appreciate our time in a city so much more if we know a bit about it ahead of time. We scour the internet, read the obligatory articles with the top ten things to do in the city and other people’s experiences, and then we dive even deeper. Our goal isn't only to plan an itinerary that includes all of the biggest tourist attractions, but one that also has many ‘hidden gems’, including a cross section of neighborhoods to explore. We find that having all of these things on our itinerary makes for a well-rounded experience, and ultimately we leave with a greater appreciation and understanding for the history and culture of a city. 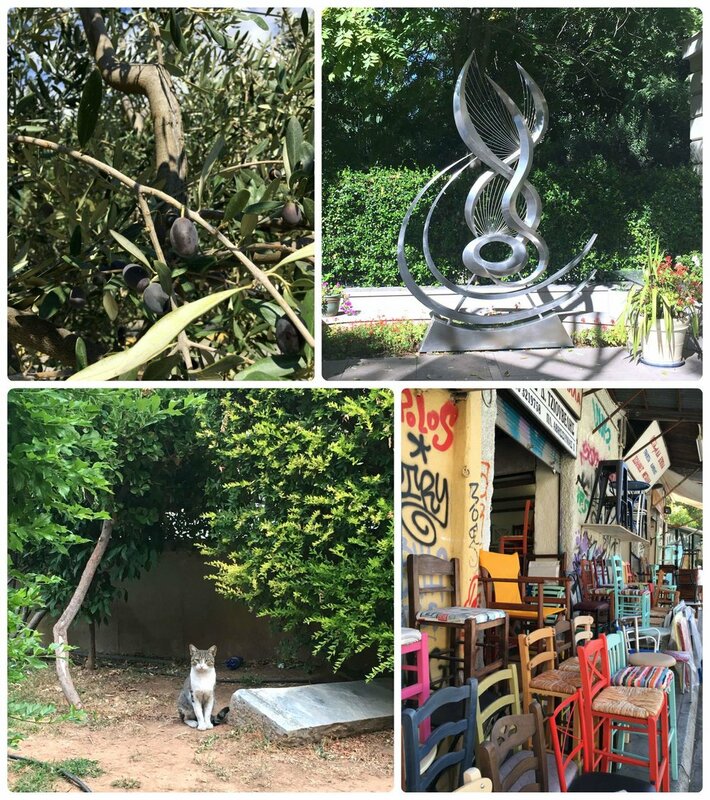 Clockwise (from the top left): It was no surprise that we spotted olive trees in Athens, a piece of at work in front of the B&M Theocharakis Foundation for the Fine Arts and Music, a colorful shop that caught our attention, there were cats all over Athens (it reminded us of Istanbul)! So, to possibly make your research on sightseeing in Athens (and other destinations) easier, we’ve kept our maps with all of the information we gathered (accurate at the time of our sightseeing). Finding hours, prices, and general information can sometimes be challenging, so we’ve tried to include these details on our maps and provide appropriate links below. And finally, not every attraction is suitable for every visitor, but the copywriters and marketing departments for the destinations sure make it sound like it. How many times have you read “Great for kids and adults alike” and shown up at the venue to wonder why anyone over 20 years-old without kids would go out of their way to be there? Below we’ve included our itinerary with tips, impressions, and our takeaways on each place that, when combined with the official attraction information and website, may help you decide if it’s a destination for your travel adventure or not. NOTE: We used this sightseeing map for our personal sightseeing adventures, because of that, some notes may not make perfect sense, and some information could be outdated. Information on this map was valid at the time of creation. All prices are shown in US dollars but are actually Euros (local currency). That being said, feel free to save it to your Google account and use it as a starting point (or modify it accordingly) for planning out your personalized itinerary in Athens. Tip: If you’re looking to move around Athens, be sure to check out our City Guide to Athens, Greece: Part 1 | Public Transportation. Athens is a beautiful and unique city that's best appreciated by walking around to see what can be discovered! The modern city of Athens is built on top of the Ancient City, so it seems that almost anywhere you go, you’ll find something ancient or interesting to see. There are ruins that date back over 2,500 years, artifacts from as far back as the seventh century BCE, famous Greek neighborhoods, street art, and so much more. Our map includes a vast amount of things to do in Athens, but we’re highlighting some of our favorites here. We hope you fall in love with the city just as we did! Ancient Athenian Ruins are such a huge part of Athens that we’ve included them in their own post, City Guide to Athens, Greece: Part 3 | Visiting Ancient Ruins. No trip to Athens is complete without a visit to these ruins, so don’t miss all the information and tips on the top things to do, including the Acropolis of Athens! This museum houses the ancient antiquities of Greece, with its focus being the treasures of the Acropolis of Athens. Its modern design is in strong contrast to the ancient objects it houses, but we found that the clean lines and open spaces, featured the exhibits superbly. From the moment we arrived at the museum, even before entering the front doors, we were treated to a view of the ruins beneath our feet, which were excavated during the construction of the building. When we entered, we went through the obligatory security check and purchased surprisingly inexpensive admission tickets (costing only €5 at the time of our visit). The modern architectural design of the Acropolis Museum, Athens is a smart contrast to the ancient artifacts that are displayed inside. The modern city of Athens, Greece is built upon the ruins of Ancient Athens and the Acropolis Museum does a fantastic job at displaying the ruins that were uncovered beneath the grounds of the museum. The walk up to the first floor (in Europe the first floor is an American second floor) is bound to make quite an impression on most visitors and set the stage for what the rest of the museum has to offer. On the first and second floors, we were treated to artifacts that were found on the slopes of the Acropolis of Athens, ranging from objects Athenians used in everyday life, to items found in sanctuaries. As we continued to explore the museum exhibits on these floors, we admired the large open rooms that were filled with elegant statues that were primarily offerings to the Goddess Athena, and bronze figurines and artifacts that were found from temples that predate the Parthenon. A highlight for us, was the stunning display of the five caryatids from the Maidens Porch on the Erechtheion within the Acropolis of Athens (the 6th is on display in the British Museum). Artifacts displayed at the Acropolis Museum Athens. Clockwise (from the top): Five of the six original caryatids from the Maidens Porch (on the Erechtheion within the Athens Acropolis) are elegantly displayed in the center of the museum, the Decree of the Boule (Parliament) and the Demos of the Athenians regulating the relations of Athens with Chalkis dated 446/5 BCE, Colossal Statue of Athena dated 525 BCE. Various displays inside the Acropolis Museum Athens, including sculptures and gold coins. The Acropolis Museum Athens is well known for its third floor collection, The Parthenon Gallery. Here, the frieze from the Parthenon has been installed to the exact dimensions of the monument, allowing visitors to walk the circumference and view the details as if they were walking the perimeter of the Parthenon. As you might imagine, there are pieces missing and some sections are cast copies of the original pieces, which are on display in museums abroad, such as the British Museum and the Louvre. The third floor of the Acropolis Museum Athens holds the frieze from the Parthenon and the Akroterion that topped the Parthenon. The value for the museum is incredible, as visitors would probably be happy to pay 100% to 200% above current ticket prices. Plus, the location of the museum is perfect, as it sits near the south slope, giving the entire museum, with it’s large unobstructed windows, a panoramic backdrop of the Acropolis of Athens. Nothing is more satisfying than viewing the up-close details of an artifact and being able to look out and see its place of origin shining on the hilltop just above you. And for an even more impressive view, visitors are welcomed to the balcony café for drinks and a meal, which is said to serve excellent Greek cuisine. The view from the panoramic windows of the Acropolis Museum athens aren't only spectacular, but a perfect backdrop for the ancient treasures on display. All of this for just 5 Euros sure draws a crowd. We arrived early in the morning and avoided the line we saw when passing by the museum later in the afternoon. Overall, our impression of the Acropolis Museum Athens was extremely high. In contrast to the display and preservation of the great antiquities held at the Egyptian Museum in Cairo, it seems the Greeks have gone to great lengths to highlight and protect the thousands of years of history held within the walls of the Acropolis Museum Athens. When visiting, we do suggest showing up before 10 am, as the lines for the museum can get very long as the day progresses. Museum information can be found on the Acropolis Museum webpage. Plaka is one of the oldest neighborhoods in Athens and is also known as the ‘Neighborhood of the Gods’ because of its proximity to the Acropolis of Athens. The area is one of the most popular neighborhoods for a reason, as both locals and tourists enjoy the shops, restaurants, and charming environment. In addition to the souvenir and eating opportunities, since the area was built atop ancient Athenian residential areas, Plaka neighborhood has been a prime place for archaeological excavations, thus many museums and archaeological exhibits within its boundaries are open to the public. To top it all off, Plaka neighborhood embodies the quintessential aura that you’d expect a Greek neighborhood to have. The streets are narrow, the architecture and gardens are beautiful, and the overall feel is one of comfortable elegance. Plaka is a very well known neighborhood in Athens! In addition to exploring Plaka neighborhood, you can also see the Roman Agora ancient ruin (left image) and the Monument to Lysikratous (right image). A few days after our house sit began, our hosts recommended we visit the Anafiotika neighborhood, however, we quickly realized that we’d unknowingly made our way through the narrow winding streets of this area already. It’s located within Plaka neighborhood, on the northeast side of the Acropolis of Athens hill, and is a small but scenic area that you shouldn’t miss. It was first settled during the Otto of Greece era when people from Anafi Island came to Athens to work in refurbishing King Othon’s Palace. Therefore, it’s not a surprise that with homes built into the hill and small streets (some only wide enough for pedestrians), this neighborhood has the feel of a Greek Island Village. When we visited, we put away our map and let our eyes direct us down the most interesting streets. We found cats in gardens and on walls, stair pathways lined with quaint cafés, charming homes, and virtually no tourist shops. If you visit just one neighborhood in Athens, this should be the one! To get a taste of neighborhoods on the Greek Islands, don't miss a walk around Anafiotika neighborhood in Athens, Greece! Monastiraki Square in the early morning hours. You may not see Mosque Tzisdarakis right away, as it’s surrounded by shops and sits to the side of Monastiraki Square, but it’s certainly worth your attention. It was built in 1759 and has been known by many names, "Mosque of the Lower Fountain" (Τζαμί του Κάτω Σιντριβανιού) or "Mosque of the Lower Market" (Τζαμί του Κάτω Παζαριού) due to its proximity to the Ancient Agora of Athens. The story goes that, despite the belief it would release evil spirits on the city, Ottoman Governor Mustapha Agha Tzistarakis, used a pillar of the Temple of Olympian Zeus to build the mosque. Tzidarakis was removed from his position when fears of the vengeful spirits he released were confirmed by the outbreak of plague later that year. Over the centuries, the building has been used as an assembly hall for town elders, a venue for a ball in honor of King Otto of Greece, a storage site, barracks, a prison, and as a museum. The present day building is void of a minaret and houses the V. Kyriazopoulos Pottery Collection of Ceramics. Mosque Tzisdarakis is located in Monastiraki Square in Athens, Greece. Today, visitors can see the remnants of the 100 columns that bordered the courtyard, and the 11th century church that sits on the site. Although, for even more information on visiting the site, visit the official governing website. Tip: Hadrian's Library is one of the seven archaeological sites participating in the Athens Combined Ticket. Save money and purchase one ticket for all seven sites! Hadrian's Library can be found on the East Side of Monastiraki Square in Athens, Greece. Explore this popular Athenian flea market and be careful not to get lost (or do, it’s your call!) in the maze of narrow streets packed with shops selling every type of treasure you can imagine. Come in the afternoon and evening to see street performers and experience the full extent of the crowded and bustling market. Additionally, for the most immersive experience, Sundays are the most popular and busiest days. However, be aware of your pockets and belongings, as like any crowded area, pick-pocketers can be a concern (Travel Hack #3: Keeping Yourself and Your Belongings Safer). Finally, for a completely different experience, visit in the early morning or late evening when the shops are closed and their shutters (covers) are pulled down, as they're covered in street art! We visited Monastiraki Flea Market in the early morning hours, before the shops were open. We enjoyed exploring the street art that was only visible when the shops are closed, however later in the day, this area was bustling with people! Tip: Athens is full of great street markets! We found many while exploring Athens and enjoyed the enormous variety of products and foods that could be found. If you want to visit more markets, consider these popular ones: Central Market in Athens (Varvakeios), Platia Avissinias (Sundays), Evripidou Street Market, and Pandrossou Street Market. Athen's street markets offer such a large diversity of products! If you’re wondering where Monastiraki Square got its name, then look no further. This small church is what’s left of a nunnery from the Byzantine era and Turkish rule. While it’s now known as Pantanassa Church (it’s dedicated to Panagia Pantanassa) it was originally known as Big Monastery (circa 1678). Depending on who you ask, the church is dated anywhere from the seventh to the 12th century and interestingly, you may notice while visiting that nearly 30% of the building is underground. If you’re looking for an authentic kebab and souvlaki (essentially a gyro) experience, Savvas is going to be one of the best restaurants in Athens. It’s located just outside of Monastiraki Square, has rooftop seating with stunning views of the Acropolis of Athens, and is also said to be the first kebab restaurant in Athens, first opening in 1925, and to present day, still owned by the same family! If you don’t know what to order, we’d recommend a Greek Salad starter, followed by a pastourmali or a souvlaki for an authentic Greek experience! Tip: ISAP train station is located in Monastiraki square, making it easily accessible by the metro. See more on how to get around Athens and navigate public transportation in our City Guide to Athens, Greece: Part 1 | Public Transportation. The site of the Panathenaic Stadium has a long history, originally housing a racecourse circa 330 BCE that was used for the Panathenaic Games. The stadium was rebuilt in 144 CE, but abandoned in the fourth century, being revived when it was excavated in 1869 and used to host the first modern Olympic Games in 1896. The Olympic tradition is carried on with each game, as it’s the ceremonial place for the Olympic Flame Handover to the host nation for the Winter, Summer, and Youth Olympic Games. You don’t have to take our word for it (shout out to LeVar Burton! ), the impressiveness of the stadium is apparent, with the Olympic and Greek flags flying over the historic stadium, which is the only one in the world to be made completely of marble! While there, don’t forget to take your winning picture atop the medal pedestal. The historic Panathenaic Stadium in Athens can be seen from the street at no cost, or visitors can purchase tickets to enter the stadium, if they perfer. It doesn’t take walking very far along one of the paths in the National Garden to forget the busy streets and traffic of city center Athens. You can escape the summer heat by meandering through the 15.5 hectors (38 acres) of the National Garden, which is located next to the Presidential Palace and has seven entrances, the main one being on Amalias Avenue. Originally, it was known as the Royal Garden, which was constructed on behalf of Queen Amalia (wife of King Otto), who is said to have spent several hours here each day. Though, in 1920 it was made a public garden and renamed the National Garden. Today, while many of the exotic species of plants that were originally imported for the Royal Garden were unable to withstand the dry Mediterranean climate, some have survived and can be enjoyed by visitors, along with a small zoo, a duck pond, and a small café. When visiting, don’t miss the conservatory which was the place where plants were originally cultivated before being permanently planted in the garden, and is considered the first working greenhouse in Greece. Tip: When visiting the National Garden, be sure not to miss the adjacent historical Zappeion Hall and of course, the Presidential Palace/Mansion of Athens. The National Garden in Athens is huge and has many different and interesting landscapes within it! We were surprised to find a variety of animals, from turtles and Koi fish in the ponds to a micro zoo in the middle of the National Garden! National Garden is a bit of a maze to explore, however there are maps and signs posted throughout the garden. Zappeion Hall dates back to 1869, when a law was passed making the building specifically for the works of the Olympic Games. The building is named after Evangelis Zappas, who was a proponent for reviving the Olympic Games, and who convinced King Otto to establish the Olympic Trust Fund. Zappas was a large financial backer of the Panathenaic Stadium refurbishment, but sadly, he didn’t survive to see his work completed, neither with the completion of Zappeion Hall or with the revival of the Olympic Games. Zappa died in 1865, and the first stone for Zappeion Hall was laid in 1874, and consequently opened in 1888, making it the first building with the sole purpose of supporting the modern Olympic Games. The Zappeion Hall is an imposing structure in Athens, Greece. The square and fountain in front of the hall are wonderful meeting places in the warm sun! The building is beautiful and visiting the atrium is free during opening hours. While there, get the full effect of the magnificent two-story arcade with pillars that span both stories by picturing in your minds eye the fencing competition that was held in the atrium in the 1896 games. The building was again used during the 1906 Games as the Olympic Village, and has since, been home to a hospital, used as a storehouse and barracks during German occupation, and it was the first Greek state radio station. In more recent history, Greece’s accession to the European Financial Community was signed at Zappeion Hall in 1979, and in the 2004 Olympics it served as a press center. Information, including tour information and the events calendar can be found on the Zappeion website. The interior courtyard of Zappeion Hall is stunning and the details on the ceilings are impressive! The Presidential Palace, with its imposing presence, was constructed between 1891 and 1897 and was originally known as the Royal Residence. We found the most interesting part of our visit to the palace to be the Changing of the Guards Ceremony that takes place on Sunday at 11:00 am. The Guards, known as Evezone, are accompanied by a military band and start their march at their barracks located behind the Parliament building. The soldiers march along Vasilissis Sofias Avenue to the Tomb of the Unknown Soldier, where they complete the Changing of the Guards Ceremony. In addition, even if you can’t be there to see the ceremony, you can still see the Evezone guarding the Tomb of the Unknown Soldier and the presidential Palace. The Athens Presidential Palace is hidden behind the trees, but the Presidential Guard is more easily seen, as they're stationed on the sidewalk in front of the palace. Located in Psyrri neighborhood, and not too far from Monastiraki Square, it wasn’t too long ago that you wouldn’t likely walk down this street, as it was an industrial alleyway that attracted seedy characters and was avoided even by locals and often referred to as a ‘public toilet’. Managed by Before Light design group and the non-profit Imagine the City, the street was eventually transformed. The dark alley was lit with lamps of all types and the buildings were painted in light colors to liven the street. Today, it now welcomes visitors into Psyrri neighborhood and is a place that Athenians can be proud of. And remember, when you visit, be sure to look up, but not too much, as you don’t want to overlook the interesting shops that line the alleyway. Pittaki Street in Athens is such a fun street to walk; the expression and influence of the community can be seen in each and every lamp! Athens may not be a Greek Island or a traditional Greek village, but it’s still not to be missed! The ancient ruins in Athens are magnificent and the street art is colorful, but be sure to explore our map for the rest of the must see attractions the city has to offer. We loved our time in Athens, and hope you fall in love with the city too!